Space is filling up fast for the IoT in Action event in Orlando. Make sure you register for free today! At a Missouri hospital, babies born with congenital heart disease benefit from remote monitoring solutions that allow doctors to see their vital signs within two minutes of the data being collected. If there are any issues with their heart rate, weight or oxygen saturation, care teams can act quickly and provide proactive care in a secure way. Since the hospital built their own Internet of Things (IoT) solution, no baby under its care with HLHS (hypoplastic left heart syndrome) has died. Many healthcare organizations are turning to intelligent healthcare to transform care by engaging patients, empowering care teams and optimizing organizational effectiveness. 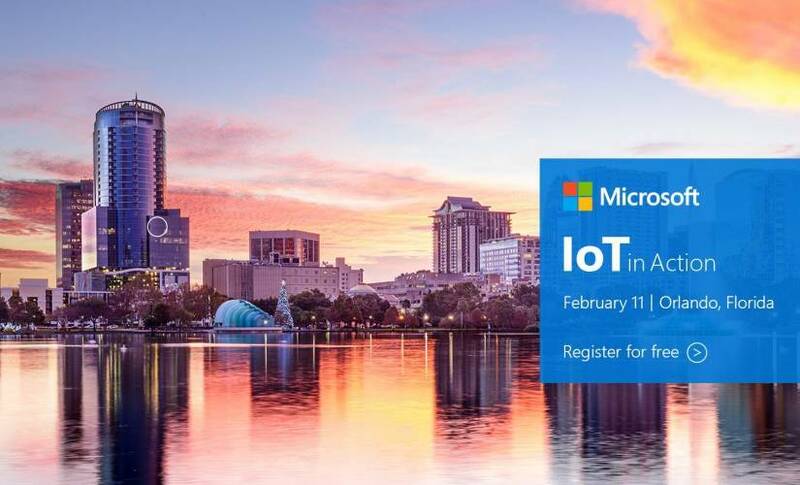 To learn more about how you can transform your own healthcare system with intelligent IoT solutions, reserve your seat for the IoT in Action event in Orlando on February 11, 2019. Overcome industry challenges with intelligent healthcare. The opportunity for using IoT to transform healthcare is immense, with the potential IoT healthcare market projected at $158 billion by 2022. Many hospitals are turning to intelligent healthcare using IoT technology to overcome the many challenges facing the healthcare industry — an aging population, increased patient expectations, chronic diseases, and increased regulations. Organizations using IoT solutions must also ensure data confidentiality, integrity, and accessibility. Additionally, all solutions must meet regulations such as GDPD and HIPAA. To help organizations deal with sensitive and regulated data deals, Azure Sphere provides a secure, end-to-end foundation and helps ensure a HIPAA- and HITRUST-ready environment. Use intelligent health solutions to improve the patient experience and outcomes. Today’s patients and providers have higher expectations for outcomes as well as the patient experience. IoT and data-driven insights allow providers to provide personalized care and help increase patient engagement by giving them control of their health. Plus, with intelligent cloud solutions, patients can strengthen relationships with their providers through secured communications. By using solutions that that empower care teams to efficiently coordinate and easily share patient insights, organizations can deliver improved patient-centric care while supporting secure, compliant, and timely communications. Healthcare systems can also drive better diagnoses and treatments by optimizing clinical and operational effectiveness. IoT solutions help organizations identify patterns and trends, connect data systems, and remotely monitor critical systems. By tracking equipment and supplies – from bandages to open or available beds – organizations can improve efficiency and reduce costs. Organizations can even monitor if employees are following hand-sanitizing protocol. Healthcare is no longer confined to within the walls of healthcare facilities. Providers can now use remote monitoring and data insights to provide precision medicine with individually tailored treatment plans. Remote monitoring also reduces expenses by lowering readmissions and eliminating unnecessarily appointments. By using devices to collect and manage data, providers can spend more time caring for patients. Employees can also see the status of their patients remotely with solutions providing real-time insights to the care team – regardless of if the provider is in another location or at home. Learn how to transform your healthcare organization with intelligent healthcare. If you are attending HIMSS, learn how your healthcare system can transform your own organization at the IoT in Action event in Orlando on February 11, 2019. You’ll gain actionable insights, deepen partnerships and unlock the transformative potential of intelligent edge and intelligent cloud for healthcare. Unable to make it to the in-person event? You can still learn about tools and strategies for driving revenue with intelligent healthcare. Sign up for the IoT in Action webinar Safer, Happier, Healthier: Your Life Sciences Digital Transformation with IoT on February 20, 2019. You will learn how IoT can provide actionable insights, deepen partnerships, and unlock the transformative potential of intelligent edge and intelligent cloud for healthcare, without leaving your office. Justin is part of the Microsoft IoT Channel Marketing team and is responsible for developing channel marketing programs – such as IoT in Action – that target Microsoft’s IoT partner ecosystem & build awareness of Microsoft IoT solutions.